TOKYO — The United States has turned to inward-looking politics, while the unifying force of Europe has waned due to rampant populism and confusion in Britain, Germany and France. The pillars that have sustained global stability are seemingly fading away. Given the situation, we cannot but be wary of confusion stemming from the intense struggle for supremacy between the United States and China. "China poses the biggest threat to America...," "China has chosen economic aggression...." High-ranking members of the U.S. administration are using harsh language to criticize China. The superpower status of the United States is under threat, and as such, it has changed its demeanor toward China — which it once called its "strategic partner" — completely. Democrats share this view with the administration of U.S. President Donald Trump. The struggle between the No. 1 and No. 2 powers of the world — economically as well as militarily — extends from trade and advanced technology to various other areas, and we should brace ourselves for the long haul. Now that 30 years have passed since the United States and the Soviet Union declared an end to the Cold War, there is no sense in being terrified of a "new Cold War" and shrinking to the sidelines. Japan, which is allied with the United States and has close ties with China, must tenaciously carry out the responsibility of maintaining regional stability and prosperity. The top priority should be to revive multilateral cooperation in which the United States plays the pivotal role. Trump's "America First" policy is a source of constant anxiety. He has prioritized seeking the immediate benefit of reducing trade deficits over matters of diplomacy and security. Tweeting does not allow for predictability, and his artless management of the U.S. administration is too much to tolerate. We should brace ourselves for the long haul. Among other issues, if suspicion that the Trump campaign colluded with Russia in the 2016 U.S. presidential election grows stronger, the president's hard-line foreign policies may shift toward an even stronger stance in an attempt to get out of hot water. Even then, there is no alternative to the United States. That country alone accounts for one-fourth of global gross domestic product and one-third of global military spending. Keeping the United States involved in the maintenance of international order will serve the national interests of Japan. 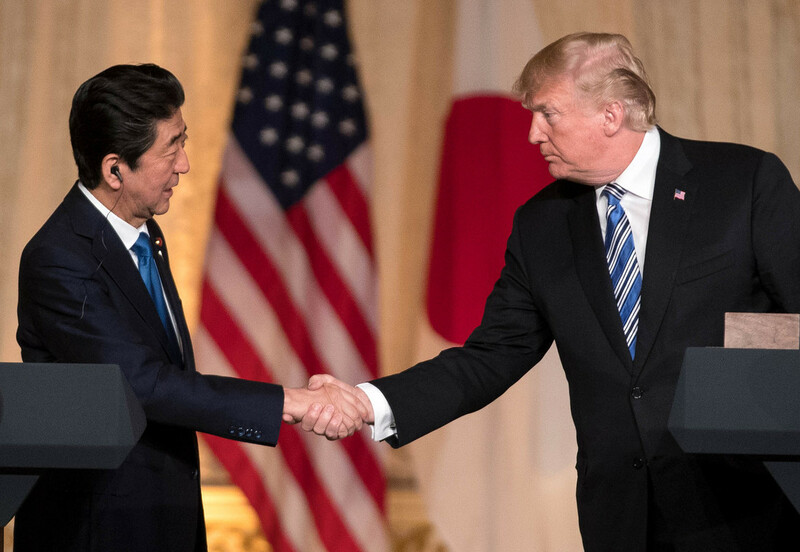 Dialogue between the leaders of Japan and the United States is important as it provides Japan with the opportunity to share its views toward China with its counterpart and to urge the United States to cooperate with other countries. Furthermore, Japan should make sure Trump does not make easy concessions to China on security policies in exchange for what he might achieve on trade. Considering the instability of the Trump administration, which continues to replace one Cabinet official after another, it is important to extensively establish strong ties with congressional leaders, bureaucrats, senior officials of the U.S. military and other key figures who can involve themselves in the making of U.S. foreign policy. A matter of concern is a situation in which the United States and China impose even higher tariffs on each other. In order to avoid a global recession, we must urge both sides to exercise self-restraint. The Japan-U.S. alliance must serve as a foundation for stability in the region. Japan — through bilateral talks with other leaders, at G7 meetings, at the G20 summit scheduled to be held in Osaka in June and at other events — should lead discussions to defuse the standoff between the United States and China. It will also be Japan's role to act as an intermediary between the United States, which tends to lean toward isolationism, and other countries. It is an urgent task to widen the network of free trade that supports multilateral cooperation. Japan is urged to make efforts to expand the Trans-Pacific Partnership trade agreement, from which the United States has withdrawn, and create free trade zones with China, India and other Asian countries, while working on trade talks with Washington. To prevent China from changing the status quo in the Senkaku Islands in Okinawa Prefecture and in the South China Sea, it is imperative to make the Japan-U.S. alliance serve as a foundation for stability in the region. The Self-Defense Forces should strengthen cooperation with the U.S. military and move ahead with the advancement of equipment and capabilities. It is crucial for Japan to deepen security cooperation also with Australia and Southeast Asian countries to complement the Japan-U.S. alliance. To face China, a long-term perspective is essential. China touted a reform and opening-up policy in 1978, raising hopes for it to become a free and open country. However, Beijing cracked down on pro-democracy protesters in the 1989 Tiananmen Square incident, after which it was slapped with harsh sanctions by the international community. China then shifted its course toward one of becoming a rich and powerful country different from Japan, the United States and European countries. China has pursued coercive diplomacy and significantly reinforced its military. Its thefts of advanced technologies from other countries, unfair economic practices and tight control of its people have been carried out at an accelerated pace. In the past three decades, the post of general secretary of the Chinese Communist Party's Central Committee has been held by three people, including current President Xi Jinping. During the same period, the United States has had five presidents, and Japan has seen a total of 17 people serve as prime minister. The average term in office is 10 years for China, while that for the United States is six years, and it is under two years for Japan. In 2018, Xi paved the way for him to stay in power indefinitely by amending the Constitution to abolish the presidential term limit. Both Japan and the United States have elections frequently. After their governments changed following the elections, their China policies wavered. China stands at a great advantage. This is because Beijing only needs to respond to criticism superficially and wait until its opponent has a change of government. China's GDP has grown about 30 times larger in the past 30 years on the back of the world's largest population of consumers and a huge industrial foundation. The country is said to intend to become a "modern socialist country that is prosperous and strong," which could have national power on par with that of the United States, in the middle of this century. Nevertheless, China's strong economy has shown signs of slowing. Its economic growth rate has been on a gradual decline. With corporate debts accumulating, concern over the bursting of the country's economic bubble cannot be wiped away. This is a good opportunity for Tokyo and Beijing to hold frank discussions. Regarding China's Belt and Road Initiative in creating a huge economic zone, Asian countries have been increasingly alarmed by excessive debts as a result of hefty loans from Beijing, as well as its political influence. China's heavy-handed expansionist stance is at a crossroads. Japan should point out to Xi and others in the Chinese leadership that if this goes on, China will hit a dead end. Now that China has shown its willingness to improve diplomatic ties with Japan due to the deterioration in its relationship with the United States, this is a good opportunity for Tokyo and Beijing to hold frank discussions. China has deep mutual dependence with Japan, the United States and European countries, in which people, goods and money come and go actively. The current situation is different from that in the Cold War period, in which the world was divided between the Eastern and Western blocs. China cannot be contained. China, for its part, cannot keep going without giving consideration to the world. The goal is to make Beijing abide by international rules and truly embrace mutual prosperity and coexistence with Japan, the United States and European countries. The strategies and diplomatic abilities of Japan and other democratic countries will be put to the test. North Korea has refrained from its past provocations with nuclear tests and ballistic missiles. It is necessary to draw up a strategy that ensures the easing of tensions on the Korean Peninsula, currently in a lull, on a permanent basis. After the U.S.-North Korea summit talks in June last year, discussions on Pyongyang's denuclearization have lost their initial momentum. Efforts should be made to convince North Korea that denuclearizing itself is indispensable for its own stability. It is necessary to continue various talks, including Trump's next meeting with Kim Jong-un, the chairman of the Workers' Party of Korea. Japan, for its part, needs to take precautions to prevent Trump from easily agreeing to make compromises. Japan also must continue calling for not only South Korea but also China and Russia to maintain the international net encircling North Korea. The Emperor will abdicate on April 30, with his Heisei era coming to a close. It is important to clarify issues that are a domestic priority and to be addressed in the next era by reflecting on the 30 years of Heisei. Emperor Akihito speaking in January 2018 — Photo: TAKA@P.P.R.S. Japan's GDP, which had accounted for 13% of global GDP in 1989, has been reduced to 6%, with its ranking dropping to third place when it was overtaken by China. Japan's population started to decrease during the era. In provincial areas suffering serious labor shortages, even maintaining infrastructure is becoming difficult. The proportion of people age 65 or older doubled to 28%. The Yomiuri Shimbun asked about perceptions of the Heisei era in a survey of the public in November last year. The survey found that more people chose "unstable" and "stagnation" than "stable" and "development." The results were totally opposite to those of a similar survey conducted shortly after the Heisei era started. What should be done to wipe away the public's pessimistic feelings? Ruling and opposition parties need to compete in their efforts to propose specific measures for the upcoming House of Councillors election this summer. The first thing to be squarely confronted is the current fiscal and financial situation. As a result of suffering a lingering economic slump and overly depending on fiscal policy, the central and local governments' combined long-term outstanding debt has topped 1.1 quadrillion yen. With the Bank of Japan's protracted monetary easing policy, low interest rates have ended up imperiling banks, a negative phenomenon that stands out under the policy. Japan has not experienced turmoil as seen in European countries and the United States. It is necessary to realize the goal of completely exiting deflation and turning to stable growth. At the same time, it is important to set a course for achieving fiscal reconstruction and to continue making efforts to eliminate ill effects caused by the monetary easing policy. Achieving those objectives is not impossible if the central government, the BOJ and the business sector join hands to map out a meticulous strategy. In order to continuously fuel the economy, it is necessary to increase consumer spending, which has remained sluggish. That is because consumers have tightened their purse strings out of anxiety for the future. It is imperative to make the medical care, nursing care and pension systems inspire enough confidence for the public to perceive them as sustainable. Given that, as life spans become longer, the number of social security benefit recipients is increasing and the number of working-age people who support the systems is decreasing, efforts should be made to restore the appropriate burden-benefit balance. Although achieving that aim comes with pain for the public, it can lower the price to be paid by future generations. The consumption tax rate hike, which is to support the social security system, will be implemented in October. The tax rate, which started at 3% in 1989, will have reached 10% over a period of 30 years. Consumption taxes are imposed on a broader range of people than income taxes and are much less prone to the influences of economic fluctuations. It is significant to have the public thoroughly understand that this revenue is a stable fiscal resource for a super-aging society. Fortunately, Japan has not experienced turmoil as seen in European countries and the United States, such as extreme divisions in society, the emergence of far-right or far-left groups and grave disparities. It is hoped the current Japanese society, which is stable, will be handed down to the next era with its characteristic qualities of good public order, enthusiasm for education and respect for being hardworking.